Among marine ornamental fishes, Clown fishes are very popular due to their aesthetic appeal and easy adaptability to captive condition. Colour is one of the major factors, which determines the price of ornamental fish in world market. Fishes are coloured in nature often start fading under captive conditions. A variety of natural and synthetic pigments are available to enhance the skin colouration of ornamental fishes. They also display their body colours for multiple purposes such as communication, identification, camouflage, defense, mimicry and adoption to the environment (Saxena, 1994). The body colours of fish dependent on the special cells in tissue called chromatophores. There are four main groups of pigments that can be used to provide colours in these cells are melanins, carotenoids, pteridines and purines. Carotenoids are major pigmenting compounds and cannot typically be synthesized by fish; these must be obtained from feeding upon algae, coral or prey in wild, which accumulated these pigments. In contrast, most other pigmenting compounds can be made by fish (Choubert, 1979). The use of carotenoids as pigments in aquaculture is well documented and it appears that their broader functions include a role as an antioxidant, provitamin-A activity, immune enhancement, reproduction, growth, maturation and photoprotection. Colouration is controlled by the endocrine and nervous system, but dietary sources of pigments also play a role in determining colour in fishes. If enhancement of colouration can be done by administering pigment enriched feed, it will definitely improve the quality and cost of the fish (Lovell, 1992). There was few research works have been made to determine colouration in marine ornamental fishes. For instance, Spirulina have been used as a source of carotenoid pigment for rainbow trout and fancy carp (Choubert, 1979; Boonyaratpalin and Unprasert, 1989) and marigold petal meal was use for the tiger barb (Boonyarapatin and Lovell, 1977). Ramamoorthy et al. (2010) was reported the colour enhancement on marine ornamental fish, Amphiprion ocellaris using natural carotenoid sources (carrot, marigold petal, China rose petal and rose petal). So, the present study was carried out to make a trail in colour enhancement on clownfish, Amphiprion ocellaris using carotenoid sources, which were isolated from two species of seaweeds, Sargassum wightii and Gracilaria corticata, Beet root (Beta vulgaris) and also a comparison study was made with commercial astaxanthin. Seaweeds (brown and red) were collected from Mandapam regions (Lat. 09º 17.417’N; Long. 079º 08.558’E), Tamil Nadu, India and were identified by using standard reference seaweeds field manual (Dhargalkar and Devanand, 2004). Brown seaweed, Sargassum wightii (Greville, 1848) is dark-brown and contains fucoxanthin pigment. Red seaweed, Gracilaria corticata (Agardh, 1852) is reddish or purplish in colour. It contains variety of pigments, including cholorophyll a, phycobiliproteins, red phycoerythrin, blue phycocyanin, carotenes, lutein and zeaxanthin. Beet root, Beta vulgaris (Linnaeus, 1998) generally appear red to red violet in colour and contained betacyanins pigments. For the present study, beet root was collected from local market. Commercial astaxanthin is a red coloured carotenoid pigment that naturally occurs in most marine crustaceans (crabs, lobsters, shrimp, krill & barnacles) and some species of fish, for instance salmon, ornamental fishes, cray fish & trout (Bell et al., 2000). It is produced by microscopic plants, for instance micro-alga Haematococcus pluvialis, another source is from ink coloured yeast, Xanthophyllomyces dendrorhous. The commercial astaxanthin was obtained from Neutraceuticals, Perry’s House, Chennai, India. About 1 kg of brown seaweed and 1 kg of red seaweed was collected separately and brought to the laboratory in plastic bags with seawater. The samples were washed thoroughly with seawater to remove epiphytes followed by tap water and distilled water so as to remove the salts and other extraneous materials and then shade dried for 15 to 20 days and ground in an electric mixer for 2 hr. Total 5 kg of fresh beet root was collected and washed with distilled water then shade dried for 5 to 7 days and ground in an electric mixer for 1 hr. Finally, the powdered samples of seaweeds and beet root were packed and stored in refrigerator (-4ºC) for further use. The pigments were extracted from three natural sources (Olson, 1979). 100 g of each sample was weighed and soaked in three conical flasks each containing 200 ml of acetone. After 21 days of dark incubation, the samples were filtered by muslin cloth and the filtrates were concentrated individually by rotary vacuum evaporator (R-114 model) at >45°C and then freeze-dried (-80°C) to obtain solid residues. The pigment extracts of three samples were kept in sterile glass container and then stored at deep freezer (-20°C) to avoid oxidation of the pigments. Protein estimation: The total protein was estimated using the Biuret method (Raymont et.al., 1964). 1 g of natural carotenoid sources powder and diet ingredients was taken individually and 4.0 ml of biuret reagent was added in each and contents are being transferred to centrifuge tube. After 30 minutes, the sample was centrifuged for 10 minutes the supernatant was collected and the optical density was measured in a spectrophotometer (HITACHI 220S) at a wavelength of 540 nm against a blank reading. The percentage of protein was calculated by using the formula. Lipid Estimation: The extraction of lipid was done by chloroform-methanol mixture method (Folch et.al., 1956). 400 mg of natural carotenoid sources powder and diet ingredients was taken in a test tube to which 5 ml of chloroform:methanol (2:1) mixture was added. The test tube was covered with aluminium foil and allowed to stand for overnight. Then the mixture was filtered and the filtrate was collected in a pre-weighted 10 ml beaker which was then dried in an oven. The percentage of lipid was calculated by using the formula. Carbohydrate Estimation: The total carbohydrate was estimated by Phenol-sulphuric acid method (Dubois et.al., 1956). 20 mg of natural carotenoid sources powder and diet ingredients was taken and to this 1.0 ml of the distilled water was followed by 1.0 ml of the 5% phenol solution and 5 ml of concentrated Sulphuric acid one after another. The calorimetric reading was measured in a spectrophotometer (HITACHI 220S) after 30 minutes against a blank at 490 nm. The total carbohydrate was estimated by Phenol-sulphuric acid method (Dubois et.al., 1956). 20 mg of natural carotenoid sources powder and diet ingredients was taken and to this 1.0 ml of the distilled water was followed by 1.0 ml of the 5% phenol solution and 5 ml of concentrated Sulphuric acid one after another. The calorimetric reading was measured in a spectrophotometer (HITACHI 220S) after 30 minutes against a blank at 490 nm. Total antioxidant activities of pigment extracts of beet root, red and brown seaweeds were determined (Prieto et.al., 1999). The samples were taken at different concentrations (1-5 g/ml) individually and mixed with 3 ml of reagent solutions (0.6 M Sulfuric acid, 28 mM Sodium phosphate and 4 mM Ammonium molybdate). Reaction mixtures were incubated at 95°C for 90 mins, under water bath. Absorbances of all samples mixtures were measured at 695 nm. Ascorbic acid was used as a standard. Total antioxidant activity was expressed as the number of equivalence of ascorbic acid. The ingredients were used for the formulation of five different feeds were tuna fish egg powder, acetes powder, rice bran, groundnut oil cake, vitamins and minerals mix and pigment extracts (Table 1). Feed formulation was done by standard method proposed by Boonyaratpalin and Lovell (1977). Feed was formulated according to Halten et al. (1997). At first, essential amount of all powdered ingredients were blended to achieve a homogenous mixture. Subsequently, the feed ingredients were mixed with an adequate amount of boiled water and then cooked in steam for 15-20 minutes. The required amount of cod liver oil, vitamins and mineral mix were added after the heating process as they could be affected by heat. Finally, necessary levels of three powdered pigment sources (Table 1) were added independently to prepare three types of feed. The control feed did not contain pigment source. After preparing all ingredients, the pellets were prepared with manual pelletizer and dried in sunlight. In total, four types of feeds were prepared (A, B, C and control) and the same were stored in refrigerator (-4°C) until use. Table 1: Formulation of experimental diets (g/100 g). One hundred and fifty numbers of hatchery bred three months old juveniles of clownfish, Amphiprion ocellaris (length-3.2 to 3.5 cm & weight-1.2 to 1.3 g) were collected from marine ornamental fish hatchery at CAS in Marine Biology, Annamalai University, Tamil Nadu, India. The fishes were accommodated in 1000 L capacity tank for a week for conditioning. The water was treated with sand and UV filters, then biological filter was kept inside the tank for maintaining good water quality. The tank was maintained under a constant photoperiod (12 hr light: 12 hr dark) using incandescent lighting. The temperature, salinity, pH, dissolved oxygen, light and ammonia were maintained at 28ºC - 30ºC, 24 - 26 ppt, 8.1 - 8.2, 4.5 - 5.5 mg/L, 2500 - 3000 lux and 0 - 0.01 ppm respectively. The fishes were fed with boiled clam and oyster meat for one week. After conditioning of fishes, 15 nos. each of healthy individuals were transferred in to five tanks of 50 L capacity. One set of control and four sets of experimental tanks were maintained for colour enhancement study. Before starting the experiment, all fishes were starved for a day to accept new feeds. Fish were provided with aeration and fed at the rate of 3% of body weight thrice a day at 9 am, 1 pm and 5 pm. The uneaten food remaining in the tanks after feeding time was collected with pipette. Tank bottom was cleaned as needed and the fish’s health was monitored every day. Water quality parameters were maintained at optimum conditions and gave sufficient aeration to fishes. Length, weight and colour of the experimental fishes were observed on 1st day, 30th day, 60th day and 90th day (Guroy et.al., 2012). The experiments were carried out for 90 days in triplicate. Total pigments content in fish tissue was analyzed before and after end of the experiment (Boonyaratpalin and Unprasert, 1989). Five fishes were randomly sampled from each tank, total length and weight were observed. The pigments analyses have been carried out in triplicate. 1 g of fish tissue was taken in a 10 ml screw capped clear glass vials and 2.5 g of anhydrous sodium sulphate was added and the extractions were made up to 10ml with acetone. The samples were stored at -20°C for 2 days and then extracted three or four times until no colour obtained. The solution was centrifuged at 5000 rpm for 5 min and then absorption was measured by UV- spectrophotometer at a range of 200 to 800 nm. Total pigments content (mg/g)= [Absorption at maximum wavelength/ (0.25×sample weight (g))]×10. Where, 10=Dilution factor; 0.25=Extinction coefficient. The length and weight of fish were recorded prior to start and end of the experiment. The experiments were carried out overall three months, every month interval, three fish from each group were taken and analyzed the growth parameters as described by Tawwab et al. (2008). Brine shrimp are being used frequently as a food for larval fish in marine ornamental culture systems. It is an excellent choice for elementary toxicity investigations of consumer products. About 3 g of Artemia salina (Linnaeus) cysts (Sanders Great Salt Lake, Brine Shrimp Company L.C., U.S.A.) was aerated in white plastic bucket containing 10 L estuarine water (Salinity – 26 ppt) with the aid of an air pump and incubated at 27 ± 1oC with constant illumination for 18-24 hr. After incubation, newly hatched free-swimming pink-coloured nauplii was harvested and tested for toxicity assay as described by Ayesha et.al. (2010). The newly hatched 100 numbers each Artemia nauplii were transferred in to 5 bottles (5 L capacity) and individually mixed with different concentrations (5-25 g/L) of pigment extracts of beet root. The mortality percentage was also recorded at different time periods of 24, 48, 72 and 96 hr. The experiments were done in triplicate. At the end of experimental period, the mobile and dead nauplii in each bottle were counted. Nauplii were considered as dead if they were lying immobile at the bottom of bottles. The data analysis of pigments contents, growth parameters, antioxidant activity and artemia toxicity results were expressed as Mean ± SD values. All these analyses were performed using the Origin 6.1 software. The pigments yield of 22 g, 26.5 g and 33 g were obtained from brown (300 g) and red (320 g) seaweeds and beet root (125 g) respectively. The commercial astaxanthin (20 g) was directly procured from chemical company. 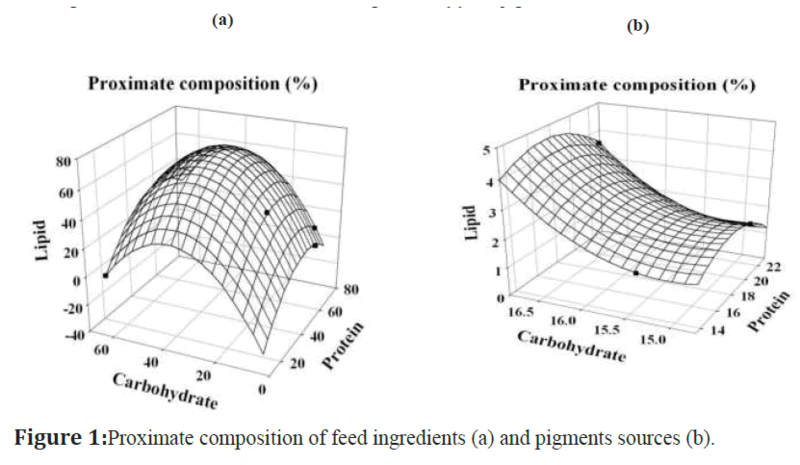 The proximate composition of feed ingredients (Figure 1a) and pigments sources (Figure 1b) were extimated. The protein content of pigments sources was ranged from 13.47 ± 0.60 - 23.12 ± 0.86%; protein content was maximum in beet root (23.12 ± 0.86%) followed by red seaweed (20.38 ± 0.73%) and brown seaweed (13.47 ± 0.60%). The carbohydrate content was ranged from 14.73 ± 0.07 - 16.86 ± 0.97%, content was high in beet root (16.86 ± 0.97%), brown seaweed (15.37 ± 0.41%) and low in red seaweed (14.73 ± 0.07%) respectively. The lipid content was ranged from 1.99 ± 0.12 - 3.53 ± 0.25%; more lipid content was in beet root (3.53 ± 0.25%), red seaweed (1.99 ± 0.12%) and less in brown seaweed (1.67 ± 0.14%). The protein content of feed ingredients was ranged from 13.2 ± 0.38 - 72.4 ± 0.78%; highest protein content was in tuna fish egg powder (72.4 ± 0.78%), followed by acetes powder (62.5 ± 0.35%), groundnut oil cake (42.5 ± 0.71%) and lowest in rice bran (13.2 ± 0.38%). The carbohydrate content was ranged from 3.8 ± 0.07 - 63.7 ± 0.51%; maximum value was recorded in rice bran (63.7 ± 0.51%), groundnut oil cake (15.2 ± 0.35%), tuna fish egg powder (7.5 ± 0.22%) and minimum was in acetes powder (3.8 ± 0.07%). The lipid content was ranged from 1.2 ± 0.13 - 40.2 ± 0.25%; content was noticed high in groundnut oil cake (40.2 ± 0.25%), tuna fish egg powder (10.8 ± 0.25%), acetes powder (6.5 ± 0.30%) and low in rice bran (1.2 ± 0.13%). Figure 1:Proximate composition of feed ingredients (a) and pigments sources (b). The antioxidant activities of pigment extracts of beet root, red and brown seaweeds were tested against standard ascorbic acid (Figure 2). 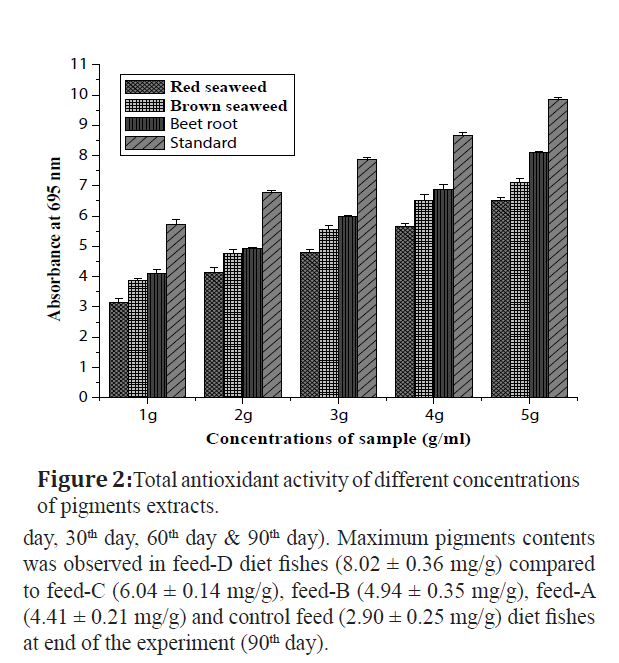 Totally five concentrations (1-5 g/ml) were used, among these, 5 g of beet root pigment extract was exhibited highest activity compared to red & brown seaweeds and showed moderate activity was against ascorbic acid. The maximum antioxidant activity was noticed in beet root (8.097 ± 0.02 g), brown seaweed (7.102 ± 0.14 g), red seaweed (6.51 ± 0.09 g) respectively, except evaluated to ascorbic acid with the equivalent concentration between 2 – 3 g. The maximum and minimum antioxidant activity by ascorbic acid was 9.85 ± 0.07 g at 5 g/ml and 5.73 ± 0.14 g at 1 g/ml. Figure 2:Total antioxidant activity of different concentrations of pigments extracts. The results (Figure 3) shows the pigments content was analyzed in different diets fishes at different days intervals (1st day, 30th day, 60th day & 90th day). Maximum pigments contents was observed in feed-D diet fishes (8.02 ± 0.36 mg/g) compared to feed-C (6.04 ± 0.14 mg/g), feed-B (4.94 ± 0.35 mg/g), feed-A (4.41 ± 0.21 mg/g) and control feed (2.90 ± 0.25 mg/g) diet fishes at end of the experiment (90th day). 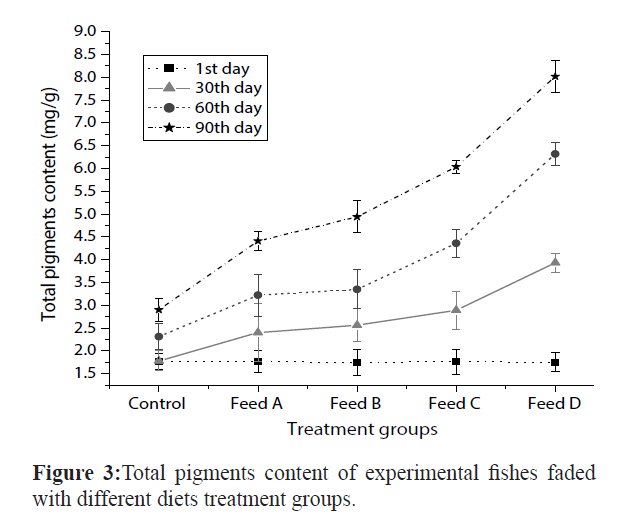 Figure 3: Total pigments content of experimental fishes faded with different diets treatment groups. Amphiprion ocellaris fishes fed with different diets and experiment was conducted for 90 days. Results (Figure 4) showed the growth rate of various diets experimental fishes at 1st day, 30th day, 60th day and 90th day. Growth rate was high in feed-D diet fishes (4.7 ± 0.29 cm), feed-A (4.6 ± 0.41 cm), feed-C (4.5 ± 0.38 cm), feed-B (4.2 ± 0.25 cm) and least in control feed (4 ± 0.35 cm) on 90th day. Initial weight (IW), final weight (FW), weight gain (WG), specific growth rate (SGR), relative growth rate (RGR) and absolute growth rate (AGR) of experimental diet fishes were recorded at end of the experiment (Table 2). The AGR was maximum in feed-D diet fishes (1.2 ± 0.21 g), feed-A (1 ± 0.20 g), feed-C (1 ± 0.01 g), feed-B (0.9 ± 0.28 g) and control feed (0.8 ± 0.18 g) correspondingly. The weight gain was more in feed-D diet fishes (1.02 ± 0.25 g) compared with feed-A (0.92 ± 0.46 g), feed-C (0.85 ± 0.31 g), feed-B (0.83 ± 0.43 g) and control feed (0.73 ± 0.28 g). The RGR was high in feed-D diet fishes (92.31 ± 0.88%) subsequently feed-A (83.33 ± 0.85%), feed-C (76.92 ± 0.65%), feed-B (75 ± 0.72%) and control feed (66.66 ± 0.74%). The SGR was observed maximum in feed-D diet fishes (1.33 ± 0.25%), feed-A (1.11 ± 0.20%), feed-C (1.11 ± 0.10%), feed-B (1 ± 0.12%) and control feed (0.89 ± 0.21%). Almost all fishes grew normally and there were no specific signs of diseases and no mortality throughout the 90 days of study periods. Figure 4:Growth rate of experimental fishes faded with different diets treatment groups. AGR - Absolute Growth Rate, SGR - Specific Growth rate, RGR - Relative Growth rate. Table 2: AGR, RGR, SGR and weight gain of Amphiprion ocellaris fed with different experimental diets. In present study, toxicity property was checked in beet root pigments extracts using Artemia salina nauplii by different concentrations (Figure 5). The mortality percentage was recorded at different time periods 24, 48, 72 and 96 hr. Among five concentrations (5 – 25 g/L), toxicity level after 96 hrs of exposure caused 46.5 ± 0.71% mortality at 25 g/L, 44 ± 1.41% mortality at 20 g/L, 29.5 ± 2.12% mortality at 15 g/L, 24 ± 1.41% mortality at 10 g/L and 19 ± 1.41% mortality at 5 g/L and no mortality was observed in control group up to 72 hr and incredibly low mortality was observed (1 ± 1.41%) at 96 hr. 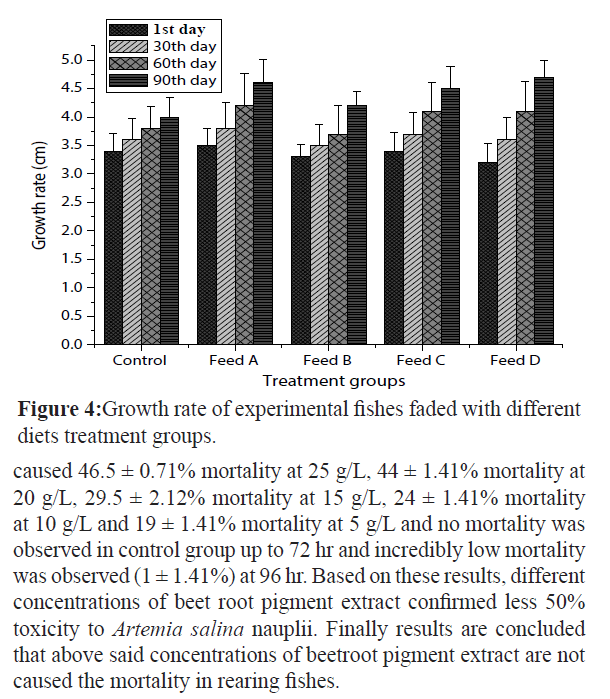 Based on these results, different concentrations of beet root pigment extract confirmed less 50% toxicity to Artemia salina nauplii. Finally results are concluded that above said concentrations of beetroot pigment extract are not caused the mortality in rearing fishes. Figure 5: Artemiatoxicity analysis of different concentrations of beet root pigment extract. In ornamental fish, Colour is one of the major factors that determines the price and marketability of several ornamental fish in fresh and marine habitats traded across the world (Manimegalai et al., 2010). In captive conditions, gradually, the fish show fade colouration and fail to get attracted by the buyers. Many different varieties of natural and synthetic pigments are available to enhance the skin colouration of ornamental fish (Saxena, 1994). Under intensive farming conditions and aquarium rearing, ornamental fish are fed exclusively on compound feeds, which must therefore be supplemented with carotenoids. Various synthetic carotenoids (β-carotene, canthaxanthin, zeaxanthin and astaxanthin) and natural sources (yeast, bacteria, algae, higher plants and crustacean meal) have been used as dietary supplement to enhance the pigmentation of fish and crustaceans (Shahidi and Brown, 1998; Kalinowski et al., 2005). However, because of public concerns about the use of synthetic additives, alternative natural carotenoid sources have also been studied. Producers prefer natural carotenoids due to increase cost of feed with synthetic carotenoids (Ezhil et.al., 2008). 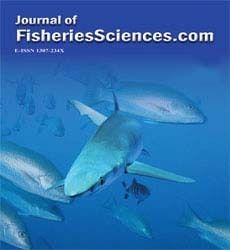 In ornamental aquaculture industry, feed additives such as carrots, beetroots, red peppers, marigold flowers, rose petals, china roses, chestnut flowers, Spirulina, crustacean waste, yeast, synthetic astaxanthin, vitamin C and vitamin E have long been used to obtain pigmentation and desired quality of fish (Nandeesha et al., 1998; Nakagawa and Montgomery, 2007). For the present study, in the nutrition trial, supplementation of different formulated feeds using natural pigments (carotenoids) sources had clear beneficial effects on the growth and skin colouration of experimental fishes. Among five formulated feeds, feed-D diet fishes exhibited the highest SGR, AGR, RGR and WG compared to other experimental diets fishes. Feed-D diet contain beetroot pigments extract, it is rich in proteins, carbohydrate and lipids compared to other pigments sources, it has been identified as a potential feed ingredient for ornamental fish and appears to be a promising dietary ingredient. Numerous studies are reported that carotenoid pigments play a major role to enhance the skin colouration, growth and reproduction. Besides their use for colour enrichment in fish, carotenoids are excellent antioxidants. For instances, Wang et.al. (2005) discussed the dietary carotenoid supplement made differences in survival, growth, pigmentation and antioxidant capacity of Hyphessobrycon callistus. Betul et.al. (2012) reported Spirulina meal has potential to enhance the growth, reproductive performance and colouration on yellow tail cichlid, Pseudotropheus acei. Ahilan et.al. (2008) studied the effect of three botanical additives (coriander, mint and amaranth leaves) on growth and body colouration of goldfish, Carassius auratus. The study concluded, botanical additives had a positive role in growth and colour development of goldfish. According to the rate of colour development, it is seemed to depend on the amount and nature of carotenoids present in the pigment source/ ingredient (Boonyaratpalin and Unprasert, 1989). Chatzifotis et.al. (2005) evaluated the effect of different carotenoid sources on skin colouration of cultured red porgy (Pagrus pagrus). In this study, carotenoid source had a significant effect on skin hue, promoting a reddish colouration to dorsal skin area and ventral hue similar to wild red porgy. Manimegalai et.al. (2010) reported the dietary astaxanthin was more effective than β-carotene in deposition of body astaxanthin in the fish, Etroplus maculatus. Sheenan and Daniel (2007) examined the effects of adding carotenoids from Oleoresin paprika to fish feeds for ornamental dwarf cichlid, Microgeophagus ramirezi. Banani et.al. (2010) reported the growth and pigmentation in fantail guppy, Poecilia reticulata was more while they diet with carotenoid enriched feed. Sajjad et.al. (2012) investigated the effects of tomato (Solanum lycopersicum), carrot (Daucus carota) and red bell pepper (Capsicum annuum) as a natural pigment sources and astaxanthin as synthetic pigment source on the skin colour of guppy fish, Poecilia reticulata. Mehmet and Halil (2006) studied the effect of tomato powders as a dietary supplement on skin pigmentation of goldfish, Carassius auratus (Linnaeus, 1758). Hence, the present study is a first kind of work to evaluate the red & brown seaweeds, beet root and commercial astaxanthin to enhance the colour of marine ornamental fish, Amphiprion ocellaris faded with different formulated feeds. The results clearly showed the dietary carotenoid concentration of feed-D influenced the level of pigment accumulation in the body, causing a stronger graded expression of colour in comparison with other diets fishes. The feed-D diet contains beet root pigment extract and has rich carotenoid pigment betacyanins, it is one of the potential antioxidant pigment and also having less Artemia toxicity properties. In the present study, commercial astaxanthin was tested although this pigment was more costly compared to natural pigment sources. The pigment extract of red and brown seaweeds also exhibited the some toxicity effects and moreover having less pigments content. Hence, the present study is concluded that beet root has rich carotenoid pigment source and is an easy digestible food material. This may be a reason for good colouration and better growth appeared in experimental fishes treated with feed-D diet. Further studies will also need to isolate the purified pigment from crude pigment extracts of beet root and trials with fishes in aquarium condition. In addition, water quality may also play a supportive role in determining the colour of ornamental fishes. Degraded water quality can cause stress in fish and may dull the fish colours. A good quality biological filter and timely water exchange will provide better environment for displaying their brightest colours. Application of pigments is an essential need for the colour enhancement and health of fishes in ornamental sector while high cost of commercially available pigments is one of the major problems, as a result the present study would be valuable intended for locally available natural sources used as supplementation of pigments. In addition, ornamental aquarists and farmers can get the benefits of pigments by using natural sources. There is a need to standardize the dose of locally available natural sources for more production of pigments supplementation to aquaculture industry. The authors are thankful to the authorities of the Annamalai University for providing research facilities and also thanks to University Grants Commission, New Delhi and Grant number (UGC- F.14-2 (SC) / 2009 (SA- III) for financial support through Rajiv Gandhi National Fellowship scheme. Ahilan, B., Jegan, K., Felix, N. and Ravaneswaran, K. (2008). Influence of Botanical Additives on the Growth and Colouration of Adult Goldfish, Carassiusauratus(Linnaeus). Turkish Journal of Veterinary and Animal Sciences4(4): 129-134. Ajith Kumar, T.T., Setu, S.K., Murugesan, P and Balasubramanian, T. (2010).Studies on captive breeding and larval rearing of clown fish, Amphiprionsebae using estuarine water.Indian Journal of Marine Science, 39(1): 114-119. Ayesha, Hira, Sultana, V., Ara, J. and Haque, S.E. (2010). In-vitro cytotoxicity of seaweeds from Karachi Coast on brine shrimp.Pakistan Journal of Botany, 42(5): 3555-3560. Banani, M., Arunava, M. and Samir, B. (2010).Growth and pigmentation development efficiencies in fantail guppy, Poeciliareticulatafed with commercially available feeds. AgriBiol Jour North America, 1(6): 1264-1267. Bell, J.G., McEvoy, J., Tocher, K., Sarvent, J.R., 2000. Depletion of tocopherol and astaxanthin in Atlantic salmon (Salmosalar) affect autoxidative defense and fatty acid metabolism. Jour. Nutrition., 130: 1800-1882. Betul, G., Izzet, S., Serhan, M. and Selin, K. (2012).Spirulina as a natural carotenoid source on growth, pigmentation and reproductive performance of yellowtail cichlid, Pseudotropheusacei.Aquaculture International, DOI 10.1007/s10499-012-9512-x. Boonyaratpalin, M. and Lovell, R.T. (1977).Diet preparation for aquarium fish.Aquaculture, 12: 53-62. Boonyaratpalin, M. and Unprasert, N. (1989). Effects of pigments from different sources on colour changes and growth of red Oreochromisniloticus. Aquaculture,79(1-4): 375-380. Chatzifotis, S., Pavlidis, M., Jimeno, C.D., Vardanis, G. and Sterioti, A. (2005). The effect of different carotenoid sources on skin colouration of cultured red porgy (Pagruspagrus). Aquaculture Research, 36: 1517-1525. Choubert, G. (1979). Tentative utilization of spirulina algae as a source of carotenoid pigments for rainbow trout. Aquaculture, 18: 135-143. Collette, W., Taylor, M., Green, E. and Razak, T. (2003). From ocean to aquarium: A global trade in marine ornamental species. UNEP World Conservation and Monitoring Centre (WCMC): 65pp. Dhargalkar, V.K., Devanand, K., 2004.Seaweeds: A field manual. Eds. X.N. Verlecar, V.K. Rathod, National Institute of Oceanogrphy, Goa. Dubois, M., Giles, K.A., Hamilton, J.K., Rebors, P.A. and Smith, F. (1956).Calorimetric method for determination of sugars and related substances.Analytical Chemistry,28: 350-356. Earle, K.E. (1995). The nutritional requirements of ornamental fish.Journal of Veterinary Quarterly, 17(1): 53-55. Ezhil, J., Jeyanthi, C. and Narayanan, M. (2008).Marigold as a carotenoid source on pigmentation and growth of red swordtail, Xiphophorushelleri. Turkish Journal of Fisheries and Aquatic Sciences, 8: 99-102. Folch, J., Lees, M. and Solane Stanley, G.H. (1956).A simple method for the isolation and purification of total lipids from animal tissues.Journal of Biological Chemistry, 226: 497-509. Guroy, D., Sahin, I., Guroy, B., Altin, A. and Merrifield, D.L. (2012).Effect of dietary protein level on growth performance and nitrogen excretion of yellow tail cichlid, Pseudotropheusacei.Israli Journal of Aquaculture –Bamidgeh, 64: 684pp. Halten, B., Arnesen, M.A., Jobling, M., Siikavuopio, S., Bjerkeng, B., 1997.Carotenoid pigmentation in relation to feed intake, growth and social interactions in Arctic charr, Salvelinusalpinus (L.) from two anadromous strains.Aquacult.Nutr.3: 189-199. Kalinowski, C.T., Robaina, L.E., Fernandez-Palacios, H., Schuchardt, D., Izquierdo, M.S., 2005. Effect of different carotenoid sources and their dietary levels on red porgy (Pagruspagrus) growth and skin colour. Aquaculture, 244: 223-231. Lovell, R.T. (1992). Dietary enhancement of colour in ornamental fish.AquacultureMagazine,18: 77-79. Manimegalai, M., Bupesh, G., Mirunalini, M., Vasanth, S. and Karthikeyini, S. (2010).Colour enhancement studies on Etroplusmaculatus using astaxanthin and ß-carotene. International Journal of Environmental Sciences, 1(3): 403-418. Mehmet, G. and Hali, C. (2006).Investigation of the Effect of Tomato Powders as a Dietary Supplement on Skin Pigmentation of Goldfish.Akdeniz University Fisheries Faculty Antalya, Turkey: 1-8. Nakagawa, H., Montgomery, W.L., 2007. Algae. In: Gatlin, D.M., Nakagawa, H., Sato, M. (Eds.) Dietary supplements for the health and quality of cultured fish. 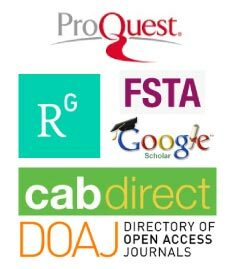 CAB International, Cromwell press, UK. 33 - 167pp. Nandeesha, M.C., Gangadhar, B., Varghese, T.J., Keshavanath, P., 1998. Effect of feeding Spirulinaplatensis on the growth, proximate composition and organoleptic quality of common carp, Cyprinuscarpio.Aquacult. Res., 29: 305-312. Olson, A. (1979). A simple dual assay for vitamin A and carotenoids in human and liver.Nutrition Reports International, 19: 807-813. Prieto, P., Pineda, M. and Aguilar, M. (1999). Spectrophotometric quantitation of antioxidant capacity through the formation of a phosphomolybdenum complex: specific application to the determination of vitamin E. Analytical Biochemistry,269: 337-341. Raymont, J.E.G., Austin, J. and Lineford, E. (1964). Biochemical studies on zooplankton: The biochemical composition of Neomycis integer. J Cans Perm EmplorMer,28: 354-363. Sajjad, M., Ali, S., Saiwan, R. and Hosseinzadeh, M. (2012). The Effect of Synthetic and Natural Pigments on the Colour of the Guppy Fish (Poeciliareticulata).Global Veterinaria, 9(2): 171-174. Saxena, A. (1994). Colouration of fish: International Symposium on Aquatic Animal Health. School of Veterinary Medicine, University of California, USA: 94pp. Shahidi, F., Brown, J.A., 1998. Carotenoid pigments in seafoods and aquaculture. Crit. Revi. Food Sci. Nutr.,38: 1-67. Sheenan, H. and Daniel, P. (2007). Colour Enhancement in the ornamental dwarf cichlidMicrogeophagusramireziby additionof plant carotenoids to the fish diet. Israli Journal of Aquaculture –Bamidgeh,59(4): 195-200. Sing, T. and Dey, V.K. (2006). Trends in world ornamental fish trade.Souvenir, Ornamentals Kerala, Dept. of Fisheries, Kerala: 3-8. Wang, Y.J., Chen, Y.H. and Pan, C.H. (2005).Effects of dietary supplementation of carotenoids on survival, growth, pigmentation and antioxidant capacity of characins Hyphessobryconcallistus.National Kaohsiung University of Marine Science and Technology, Department of Aquaculture, Kaohsiung, Taiwan, china: 811pp.